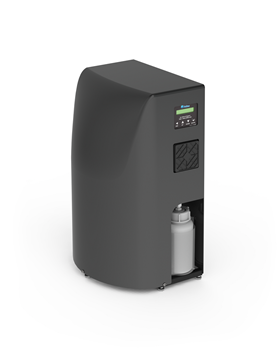 Voltea's point-of-use system, DiUse, monitors incoming water quality and “tunes” water in real time to the ideal mineral content. Voltea has announced that its DiUse and DiEntry water treatment systems have received NSF/ANSI 42 approval from the US National Sanitation Foundation (NSF) International, ensuring that the units can be used in all drinking water applications. DiUse and DiEntry each went through hundreds of thousands of cycles of operation to ensure the mechanical integrity of the systems under hydraulic pressure and were subjected to exhaustive leach testing ensuring all wetted surfaces were appropriate for drinking water applications. This procedure determines that products are safe for use and that they deliver the highest standards according to NSF/ANSI 42 Listing. Voltea’s point-of-entry system, DiEntry, residential water treatment system uses Voltea’s tunable, high recovery CapDI technology to provide complete control over the quality and taste of a home’s water while reducing environmental impact. The system uses no salt or chemicals, wastes less water than other products, and can be perfectly tuned to provide on-demand purified water. The company’s point-of-use system, DiUse, also monitors incoming water quality and “tunes” water in real time to the ideal mineral content. Despite variations in incoming water characteristics, DiUse and DiEntry self-adjust to ensure they deliver consistent, precise water quality. Dan Connorton has rejoined Voltea as global quality leader. Dutch water technology company Voltea has completed a €6 million capitalization round.